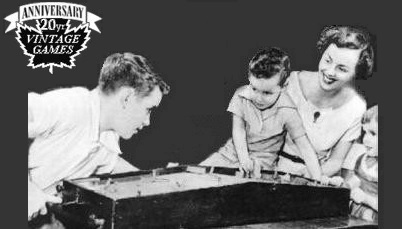 Reproduction 1940's era game endorsed by Babe Ruth - a pin-ball type game for 2 players. Pitcher controls speed and direction of ball. Batter can hit, walk, strike out or be put out. Plans include scaled diagrams, lettering, and step by step instructions to make this project from wood and standard hardware. See baseball games built by our customers. 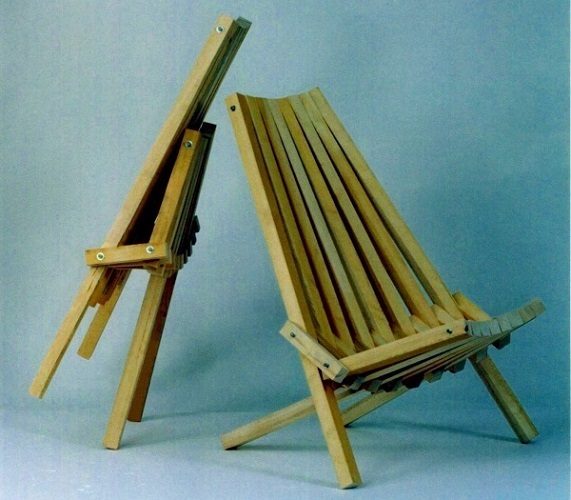 Woodworking Plans: &dollar;8.99 (U.S. currency). On display at the Hockey Hall of Fame ("Collectors' Corner"). 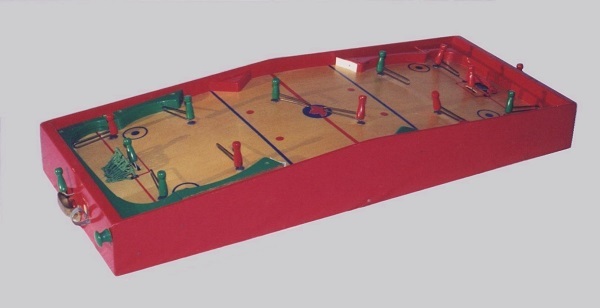 Replica of the Munro hockey game of the 1940's & 50's - the fastest table hockey game ever. Plans include scaled diagrams, full-size patterns for curved pieces and step by step instructions to build this spring-action game with wood and standard hardware. video of live hockinole action. 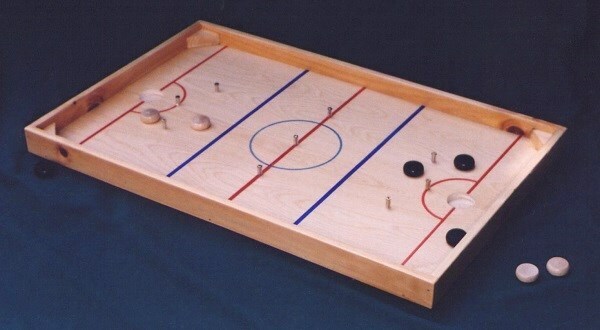 HockinoleTM combines two all-time favorite Canadian board games - table hockey and crokinole. Our plans include scaled diagrams, and step-by-step instructions to make this project from wood and standard hardware. Suggested rules included with plans. Woodworking Plans: &dollar;4. (U.S. currency). 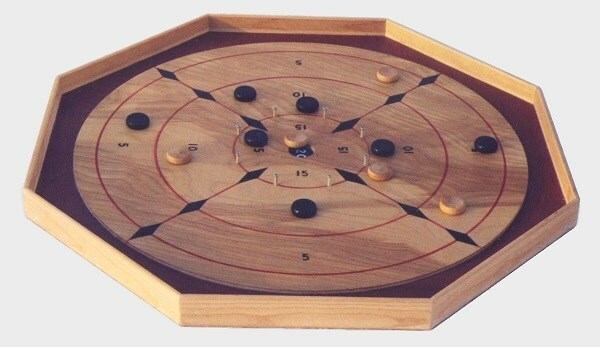 Visit our gallery to see customer-built crokinole game. 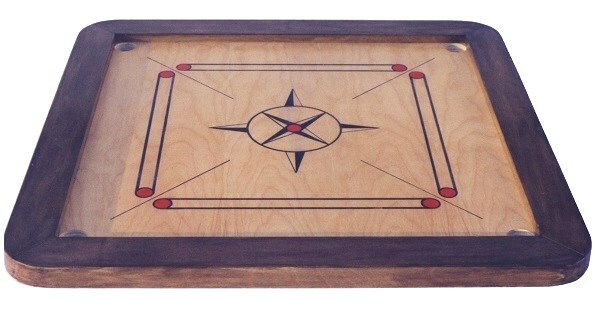 Visit our gallery to see carrom boards built by our customers and read their comments. Visit our gallery to see customer-built skittle-maze games. 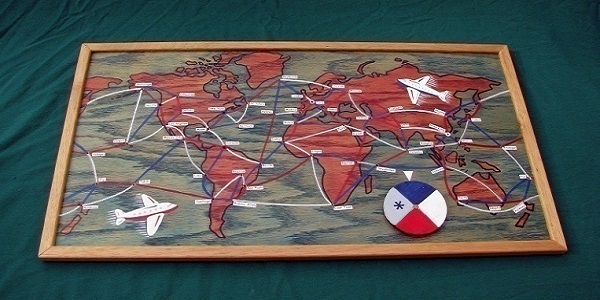 This traditional travel game provides entertainment for 2 to 4 players, ages 4 and up. Plans include scaled diagrams, scaleable map grid, printed airport names and step by step instructions to build a 25" game board with common wood and standard hardware. Woodworking Plans: &dollar;3.50 (U.S. currency). Woodworking Plans: &dollar;4. (U.S. currencey). We produce, publish and sell plans for vintage board games and other wood projects suitable for home workshops. Our customers may use these plans to build these projects, for whatever purposes they wish; however, the plans themselves, consisting of instructions and diagrams, are copyright protected and may not be copied or distributed in any format without the express permission of Vintage Games Company. Our Guarantee - your money back if you are not satisfied (see below). 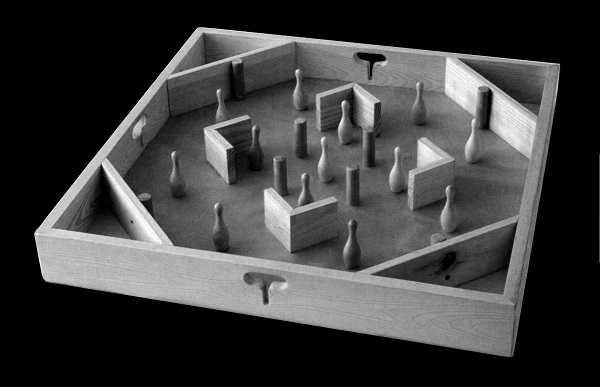 We hope you enjoy building your Vintage Games wood project; however, if for any reason you are not satisfied with our plans just return them within 30 days, with a brief description of the problem, and we will refund the purchase price, in full. Read what our customers say & see the projects they have built using our plans. In response to many inquiries about tools and skills needed to build Vintage Games wood projects we have added a skill rating system. If you are unsure whether you have the skills or tools needed to complete any of these projects, visit our comments page for further explanations. We use Paypal, electronic payment system, through ebay. To order, visit our ebay listings: go to ebay and do a search for "woodworking plans" followed by the name of the plans you are interested in. Shop teachers can order multiple copies of indvidual plans for student use at wholesale prices. Email for quote. We do not install cookies or adware on your hard drive. Correspondence with Vintage Games will not result in unwanted email. Customer information is used only to help us serve our customers. We do not share it or sell it. © 1997 - 2017 by Vintage Games Co.
Woodworking plans for action table games & other wood projects.